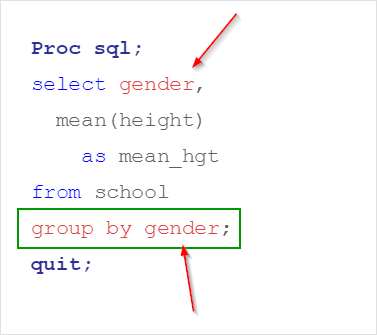 You can use Proc SQL to summarize data in a way similar to Proc Means and Proc Freq in SAS. 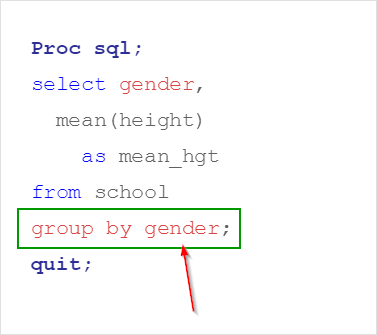 ​The MEAN function in the SELECT clause computes the average height of the students in the SCHOOL table. The GROUP BY clause is similar to the BY statement in data step. It is used when computing the statistics separately for different groups of data. 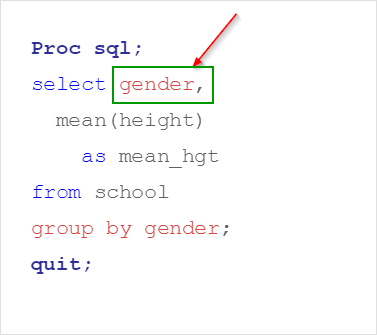 The Proc SQL step above computes the average height separately for the two genders. The average height for boys and girls are 61.32 inches and 58.95 inches, respectively. ​There are three things you need to do when grouping your analysis. 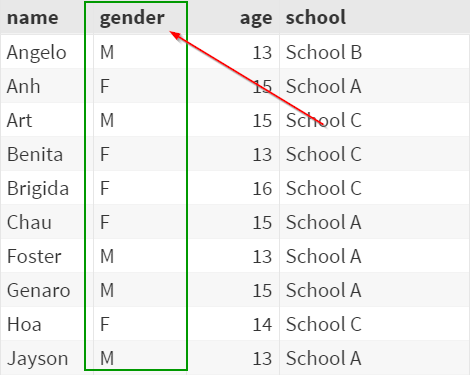 Once you identify the column(s) to group the analysis, you specify them in the GROUP BY clause. Finally, you should also specify the column in the SELECT statement. This tells SAS to display the column in the output. Write a Proc SQL step that computes the average MSRP for each car maker.